After the really complicated pick for December's Daring Baker's challenge, I was really excited to see that this month's recipe, which though requires some technique, was decidedly less involved. This month's challenge is brought to us by Karen of Bake My Day and Zorra of 1x umruehren bitte aka Kochtopf. They have chosen Tuiles from The Chocolate Book by Angélique Schmeink and Nougatine and Chocolate Tuiles from Michel Roux. With so much choice, I was a little hard pressed as to which one to make, but ultimately decided to go for the plain Tuiles. Now I've made tuiles just once before, so by no means am I an expert in this. It took several batches of tuiles before I was finally happy with the thickness, the crispness, the browning at the edges and the shaping of them. I made both the regular curved shapes by draping the tuiles over my rolling pin, and also made tuile cups by putting them into a scalloped silicone baking mould. 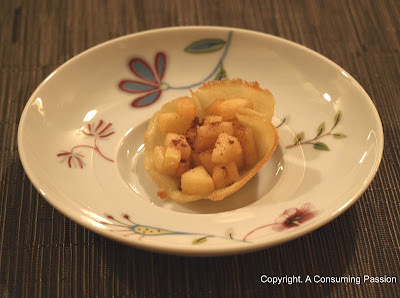 Since the challenge called for something fruity and all I had in my kitchen at the time were apples, I simply stewed some apples and put them in the tuile cups. To finish, I gave them a light dusting of cinnamon. Line a baking sheet with parchment paper or grease with either butter/spray and chill in the fridge for at least 15 minutes. This will help spread the batter more easily if using a stencil/cardboard template such as the butterfly. Press the stencil on the baking sheet and use an off sided spatula to spread batter. Leave some room in between your shapes. Bake tuiles in a preheated oven (180C/350F) for about 5-10 minutes or until the edges turn golden brown. Immediately release from baking sheet and proceed to shape/bend the cookies in the desired shape. These cookies have to be shaped when still warm, you might want to bake a small amount at a time or maybe put them in the oven to warm them up again. (Haven’t tried that). Or: place a baking sheet toward the front of the warm oven, leaving the door half open. The warmth will keep the cookies malleable. Your tuile looks delicious with the apples! A perfect pairing with the apples. Yummy!! What a refreshing dessert this would make.